million tonnes of dust expected to be injected into the atmosphere by the initial nuclear explosions this would increase the turbidity of the atmosphere to such an extent that major global cooling would take place (see Figure 5.10). 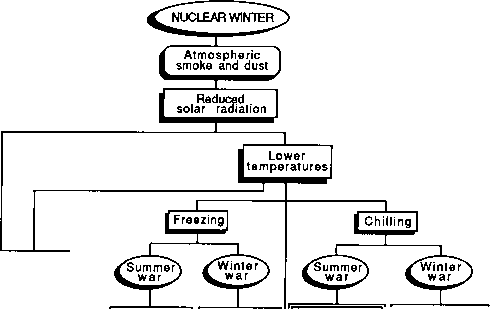 The concept of nuclear winter grew out of a study of the climatic consequences of nuclear war published by Turco et al. in 1983. The study postulated that a major nuclear conflict would be followed by a very rapid cooling of the earth, sufficient to cause temperatures to fall below freezing in some areas even in mid-summer. Because such an event would reduce temperatures to winter levels, even after a midsummer war, it was given the name nuclear winter, and the work became known as the TTAPS study from the first letters of the names of the investigators. surface. The net effect would be to drive temperatures down. Since none of this could be measured directly, estimates were based on the results of a series of mathematical simulation models. According to the TTAPS baseline scenario, a 5,000 megatonne nuclear war would inject 960 million tonnes of dust into the atmosphere (1 megatonne is equivalent to 1 million tonnes of TNT). 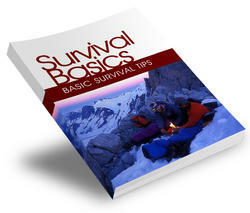 Eighty per cent would reach the stratosphere, and remain there for more than a year. This dust veil would be augmented by as much as 225 million tonnes of smoke, produced over a period of several weeks by the massive fires ignited by the initial explosions. Incorporated into the atmospheric circulation, the dust and smoke would first spread over the northern hemisphere—where it was assumed most of the nuclear explosions would take place—before being carried into the southern hemisphere, eventually to blanket the entire globe. The net result of this massive increase in atmospheric turbidity would be the reduction of incoming solar radiation by as much as 95 per cent, causing an average land surface cooling of 10-20°C and maximum cooling of up to 35°C in the the interior of the continents in a matter of weeks. The temperature reductions over the oceans and in coastal areas would be perhaps only 1-3°C because the cooling would be offset by the great heat capacity of the oceans. The juxtaposition of these relatively mild conditions with the cold over the land masses would create strong horizontal temperature and pressure gradients and lead to severe coastal storms. Changes in the vertical temperature structure of the atmosphere, induced by the absorption of large amounts of solar energy in the upper atmosphere, would also contribute to a much modified global circulation. It was estimated that recovery from all of these changes would take more than a year. The potential environmental impact of gases such as CO2 and NOX, released into the atmosphere along with the particulate matter, was recognized, and the biological consequences of nuclear winter were noted, but neither was elaborated. The TTAPS hypothesis elicited a strong response from the scientific community. The assumptions underlying the estimated endurance and intensity of the smoke and dust clouds were strongly criticized, for example, and the magnitude of the postulated temperature decline was regarded as questionable (see e.g. Maddox 1984; Singer 1984). Much of this initial criticism merely detailed perceived flaws in the study itself, and did little to develop the concept or to invalidate it (Teller 1984). Other investigators examined the mechanics of the study, and replaced its simplistic one-dimensional atmospheric model with two- and three-dimensional versions. The state-of-the-art, 3-D, general circulation models (GCMs) ultimately used included a greater number of variables and finer geographic resolution than the TTAPS model, and incorporated earth/ atmosphere feedback loops. 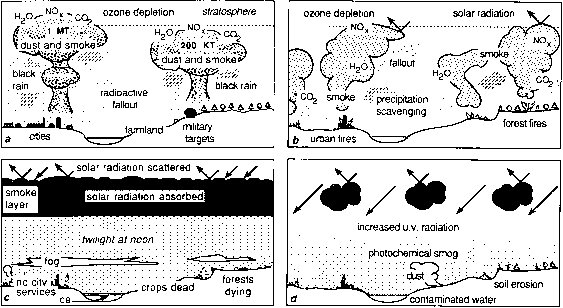 In general they indicated that planetary cooling would be much less than postulated in the TTAPS scenario, and it was suggested that the cooling following a nuclear war would be more appropriately referred to as 'nuclear autumn' (or 'nuclear fall') than nuclear winter (Thompson and Schneider 1986). (SCOPE-ENUWAR 1987; Appleby and ments Harrison 1989). The original TTAPS team has re-examined nuclear winter in light of the new information available from laboratory studies, field experiand numerical modelling (Turco et al. 1990). While areas of uncertainty remain the new research reaffirms the basic findings of the original work, including the cooling estimates upon which nuclear winter was based.